Vascular dementia, also described as multi-infarct dementia is the second most common cause of dementia in older people. Because it has a lower profile than Alzheimer’s, many people don’t think of it when forgetfulness becomes a problem. It’s also difficult to diagnose so it’s difficult to know the exact number of sufferers. 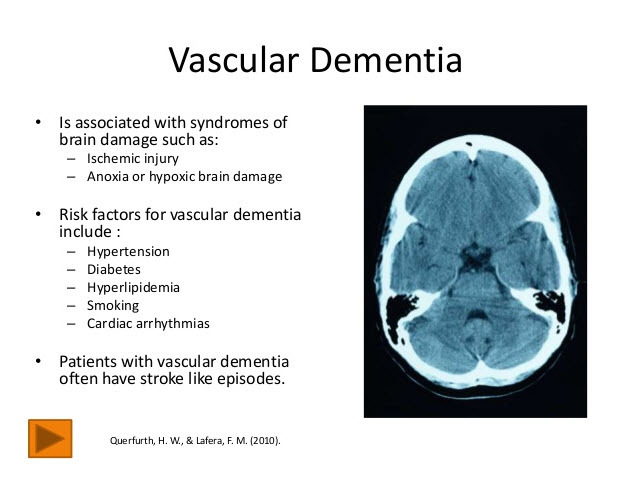 Current estimates are 15% to 20% of dementia cases in older adults are vascular dementia. Vascular dementia occurs when part of the brain doesn’t get enough blood carrying the oxygen and nutrients it needs. These blood vessels then become blocked or narrowed causing small stroke like events. Over time, the impact of multiple small strokes adds up to significant disability. Risk factors such as diabetes, high blood pressure, smoking, and high cholesterol can contribute to onset of vascular dementia. Early detection requires an awareness of these risk factors and helps to control the severity of the disease. Doctors look for symptoms that progress in noticeable stages to diagnose vascular dementia. Alzheimer’s, by comparison, progresses at a slow, steady pace. Another clue is impaired coordination or balance. In vascular dementia, problems walking or balancing can happen early. With Alzheimer’s, these symptoms usually occur late in the disease. Some risk factors for can be managed; others, like age and gender, cannot. Among all factors, high blood pressure carries the greatest risk; vascular dementia almost never occurs without it. Likewise, a high risk of stroke goes hand in hand with risk for this disease. One-quarter to one-third of strokes are thought to result in some degree of dementia. In addition, people who smoke, drink lots of alcohol, have diabetes, or heart disease also have a higher rate of the condition. Vascular dementia occurs in people between the ages of 60 and 75. Men have higher rates than women, and African-Americans more so than other races. Currently, no available treatments can repair the damage once it’s happened. Nonetheless, diagnosis provides the opportunity to prevent further damage. Prevention involves bringing high blood pressure under control through exercise, diet, and medication. The same goes for diabetes if it exists. Patients should stop smoking and drinking alcohol. While medical options are limited, behavioral interventions such as cues and reminders can improve the quality of life. Stepping up communication, reminding the person what day it is, where they live, and what is going on in the family, can help keep them connected. The Putnam Ridge Nursing and Rehabilitation Center offers a secure memory care program. This program is staffed with skilled professionals that use the latest therapy techniques in a warm, structured, and safe environment. Design enhancements to the memory care unit include secured entrances and exits, visual cues, and individual care plans. Our program provides emotional and therapeutic support that improves the abilities of each resident. Individuality is encouraged, and the patient’s dignity and respect is maintained. Structured memory care programming keeps your loved one active and engaged with therapeutic recreational activities, such as pet therapy, art programs, and music therapy. Skilled nursing staff also work on motor skills activities, occupational therapy, and other multi-sensory activities. Call us (845-278-3636) to schedule a tour of our facilities.